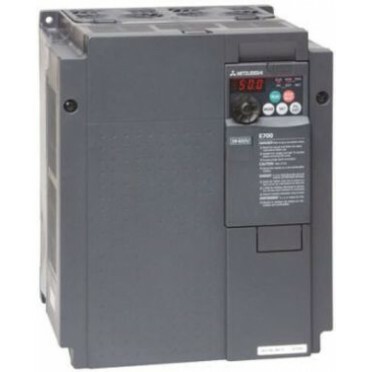 Mitsubishi FR-E700 Series AC Frequency Inverter for 3 Phase motor in VxF or Sensorless Vector control to 23A. Simple set-up with 400V three phase input for a standard AC Induction motor. Features - Front Mounted Potentiometer, 2 Analogue Inputs, 7 Digital Inputs, 1 Analogue output, 1 Relay Contact set and 2 digital output.